Howdy all. If you have any wisdom related to this recap, you can download a 1-page PDF with photos and full explanation below. It looks like there is a lot of handwork in these. The outer line looks to be entirely hand-cut. The stars are likely hand punched with a die. You should be able to do a decent job working from the straight section you have. Scan at high res, cut the image at a 45 degree angle, duplicate the layer, mirror flip, rotate 90 degrees, and bring them into alignment. You’ll have to draw the little outer point at the corner on your own. Hello Dado…. Typically these were cut either on a pantograph, or by hand as noted above. While usually of a consistent overall height, a lot of these older border elements were not cut to precise measurements within the border themselves. Thus the rules may or may not be a whole point size. They were cut in long strips and then mitered to make corners. I’ve got a few dozen long strips in my collection. If I were going to reproduce them via laser, I’d make two drawings: 1- the straight section and 2- the corners….and make the corner drawing symetrical so it will work either way. I’d make sure that the height sizing, rule spacing and various elements matched on both drawings…. then I’d not worry if there was a slight mismatch with the original. About the reason for the inconsistancy- without measuring the drawings and looking at your set-up, I can’t say…. but I’ve done a lot of lazer block cutting going back to 2008 or so. 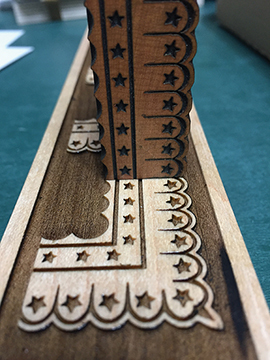 ( http://www.briarpress.org/15868 ) I can tell you from experience that the laser can cut to amazing precision IF your drawing and settings are correct. I had a problem similar you yours several times, and it usually turned out to be “scale” problem. If your set up says “scale to fit” or has any value other than 100% then it’s never going to match perfectly. If the settings are correct, then most likely your drawing is off a little. Good luck, and let us know when you find a solution. I always thought that “one line” in wood type was one pica, and I’ve been in printing for a long time.. I think the best place to get answers to your questions would be the Hamilton Wood Type Museum in Wisconsin. Last I heard, there were still some volunteers there who actually worked for Hamilton when it was operating. I’m pretty sure Hamilton was the successor to Wm. H. Page & Co., and Hamilton kept a lot of things through the years, so they might even still have the tooling for your border. Short answer is that yes, different sizes of that border probably had different masters cut that wouldn’t necessarily match other sizes’ masters. After all, it hardly would have mattered to the compositor if the 4-line’s proportions were slightly different than the 6-line’s. It’s not like they could scale one to match the other. Thanks everyone, your comments here have been very helpful. I will post some pictures of progress.